The skin is the biggest organ in the body and the one that is prone to acne and other outside forces that causes damage and irritation to the skin. Sometimes, no matter how hard one tries to eat a balance diet, clean the skin or take in vitamins great for the skin, acne still exists. Facial acne is the most common type/occurrence of acne and can take several forms. It can either be in the form of pimples, blackheads and in severe conditions, cysts. Unlike back acne’s the skin is much thinner in the face. Body acne is a condition that is similar to that of facial acne. It can take several forms: pimples, blackheads, pustules and cysts. The only difference the two has is that the skin in the back is thicker than that of the face and often with larger pores. The bigger the pores are, the more severe the acne lesions are. There is a wide variety of lupus. In some cases, the patient has to deal with swelling and joint pains or deal with fever and fatigue. But most cases of lupus deals with numerous skin rashes and lesions. This type of lupus that affects the skin is called as Cutaneous Lupus. Eczema occurs when a superficial inflammatory occurring in the skin. These include redness, itching, minute papules, oozing and crusting in the skin. In severe cases, scaling, lichenification and pigmention also occurs in the skin. The website contains approximately 400 articles that will help you know and determine which type of acne you have which is very essential in treating it properly and effectively. 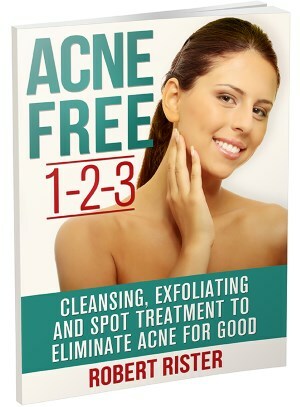 All information are Science-based and written by a best-selling author Start addressing your acne problem. Do the skin test today, just click the link that can be found on their top menu. So I need help promoting this fabulous giveaway! Mia Mariu is giving one lucky winner the same items that I received in their color choices! Awesome Beauty Prize! Who doesn’t love free stuff? I guess everybody here would really want to have new things for free. Yes, beside being a certified contest addict, I love getting free stuff and I’m so happy to be a part of Influenster who sends free new products as part of their bloggers program. Although, i’m a newbie in influenster, I’m very happy that it was introduced to me by fellow blogger friend and yes I’m already reaping the benefits and this would be my second #VoxBox from them and hoping for many to come. This month, I received this TLC VoxBox especially boxed for moms like me. Shell Fuel Rewards Network : With their reward program, you never pay full price again because every time you fill your tank, you get rewards or equivalent points and get to accumulate them for a free oil. That’s totally awesome. Breyers Gelato Indulgences : This is for all sweet tooth out there and I guess, the whole family would love to have a delicious ice cream especially during sunday night movie time. Puffs to Go – I’m definitely a fan of tissue and i always have them in my bag. This one is a great addition to my new favorites. Definitely handy. Neosporin Neo to Go : Being a mom means your always ready for anything and everything. this Neosporin Neo to Go is your ultimate solution for first aid relief in case a minor accidents happen while your out. Ivory Bar Soap : Original Bar, i love it’s cover and yes I have been a loyal user of ivory, it’s gentle to kids skin and for mommy too. Avon Anew Reversalist Express Wrinkle Smoother : Aging skin, this one is indeed a nice solution to hide those wrinkles coming from different stress in our life. Indeed Avon made it possible again this time. This box was definitely wrapped with tender loving care for moms like me. What do you think of this TLC VoxBox from inluenster? Leave your comments below and i will definitely appreciate them. Disclosure : I have received a complimentary product from Influester to facilitate my review but all opinions are mine. I have always been a lipstick addict. Over the years, my collection accumulated with different shades that i love. I believe that even though you don’t wear a full make-up a nice shade on your lips can define your face and make you lovelier and livelier. Of course, it’s not always good to pick up different lipsticks on the mall, you also need to consider the benefits that you can get from them aside from making your lips pretty , your lipstick should also possesses qualities to help your lips maintain it’s moisture and good thing, Rimmel London Moisture Renew Lipstick helps to bring back the lost moisture of your lips with additional rich color that you have always wanted. I was infused with Vitamins “A”, “C”, and “E” to help care for our lips. It’s definitely a lovely shade for everyday use or for a night affair with your family or friends. Rimmel London Moisture Renew Lipstick is definitely my new fave. Since the time I was hooked watching Korean drama,, I have seen korean actors and actress on a different light. I think, they have the pretties face because of that flawless skin and some doesn’t have any traces of imperfection. I remember a statement made by one of my fave Korean Actress that she has no secret on having good skin. She just take care of it by eating right, good sleep, a lot of water and right skin care products. That’s why learning about Hayan Cosmetics makes me smile. 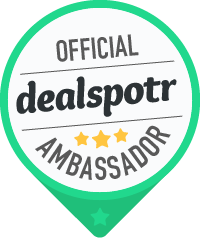 I was very happy to receive some products from them and was impressed when I used it. That’s why when I saw a franchise stall in our area, I immediately grab the opportunity to buy their nail polish and black eyeliner. Choose a base polish that is bright and apply two coats of the glitter polish. I just wish they can offer more colors. Recently, I have been obsessed on using mask sheet on my face. Irregular skin tone, dull, dry, wrinkles, dark and aging , these are just few of the many problems that our face suffer each passing day and as we grow older and more exposed to dirt and stress, we couldn’t avoid all this problems. Hayan Mask Sheets on different variants help your skin achieve a fresh and young looking skin. It moisturize, leaves a firm skin and revitalize them. Use them cold. Refrigirate before using and make sure your face is clean before applying it. Pat around your face, neck and nose. Take the mask after 15-20 minutes and no need to wash it, if there are some essence that was left, just leave them on your skin by patting them gently. I like the cold feeling on my face although I don’t like the smell of it but it’s bearable. I felt a little bit of stingy feeling or sensation on my skin when I first tried it but the second time around, it was different. It leaves a smooth feeling after using them. Definitely yes, for a very affordable price, it can help you achieve a smooth skin. One of the cutest lipstick I have owned so far. If your a regular reader of this site, you knew that I am a lipstick addict and owning different shades of lipsticks is one of my ultimate dream. Hayan Slim Lipstick is very affordable and their shade is just oh so pretty. Since, it’s slim, you can bring them anywhere even if your just using a small pouch, you can bring it out to give your lips a luscious shine. Over all, i love their products. Just I wish, i could find a product that will help minimize my under eye circles because it’s really hard to conceal them even with all the blending and concealing and foundation, I just hate it. I have been thinking of trying their snail skin care collection since I have heard great things about it. Learn more about Korean products from Hayan Cosmetics. Follow them on Facebook . Honestly, I thought I have published this post and it’s been there in my draft form for quite sometime with all the kids getting sick and no house help, it was really a tedious work but It’s not that I’m complaining and not an excuse to look at my best even with the busy and stressful days. It’s been a while since the last time I used a hair flat iron because the last one broke my heart when it didn’t last even a year. There’s always this notion that when you use hair iron everyday, your hair will become damage and frizzy. I guess, the one that can really damage your hair is coloring it or staying for so long in the heat of the sun. There are many brands that are coming in the market today all are saying that they have the best product but then when you used them you get the chance to finally see that it’s not even worth it. I am loving this Tao Titanium Classic flat iron, because it’s not just very handy and easy to use. It’s easy to heat so you don’t need to wait for such a long period of time to use them. With it’s top-of-the-line heating element the TAO Titanium flat iron allows for quick heating, quick cooling and an even distribution of heat across the nano-titanium plates. In addition, they generate 6 times more ions then metal irons which helps seal the cuticles of hair to prevent split ends, reduce frizz and retain hair’s natural moisture, oil and color! It has an ion generator that can help your hair achieve a smooth finish. Ever since I decided to take a new hair color, my hair becomes dull and frizzy but I’m so glad that this can help me with my recent hair problem. Here’s a before and after. Seeing my hair reminds me that I need to get a new hair color since the black ones are coming out again. Aside from easy to use, i like that it can create different style from curl to wavy and the usual straight one. If you are a regular reader, you will see me sporting my wavy hair before. The Tao Titanium classic flat iron is a good companion for everyday use or when you are attending a special occasion since you don’t need a stylist to create a beautiful hairdo for you. That saves time, energy and lots of money too. You can get Tao Titanium at Beauty Stop Online, an online shop that offers great deals of beauty and fashionable products for all lovely girls out there. With the likes of Angelina Jolie, Scarlett Johansson and local actress Anne Curtis showing their big pouting lips, seems many girls are now rambling about big lips. There was a time that I hate having this kind of lips. Some of my classmates would even tease me for having a different lips from my other classmates but I guess in time, I have learned to appreciate what was given to me especially when I have learned how to apply lipsticks and the thought came to me that having big lips seems an advantage for me especially when I was growing up since boys find it more attractive. Anyway, here’s a simple way I have learned on achieving a plump lips which I regularly do. First, you need to outline your lips with a darker shade of lip pencil. To achieve a more fuller or bigger lips, outline it outside the line of your lips. Choose the color that you like, lipstick, lip stains, lip glosses , this are just some of the ideas. Fill your lips with it. You can directly apply the lip color or you can also use a lip brush to attain a more lasting result. Remove the excess lipsticks /color using a Q tips. If you want your lipstick to stay more longer. Dab your lips slightly with tissue and apply another coating of lipsticks. I am now loving this Avon’s Ultra Color Lipstick. This vibrant lip color is really interesting because what color you see on the lipstick is the same color that will appear on your lips. A little note: I have learned that make up artist use concealer to help make the lips more fuller, I guess, i need to learn this trick and I will let you know once i have perfected blending the concealer to achieve more desirable result. Of course, it doesn’t stop there. You need to exercise your lips and practice on creating a beautiful pout. Sometimes, i look at the mirror and push my lips as if kissing somebody. It does help me but of course I want to know the result on you. Let me know what you think. 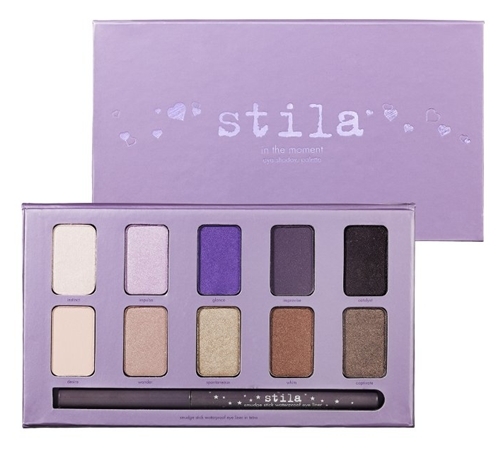 A gorgeous, palette with 10 shades of Stila’s award-winning eye shadow formula that can be worn wet or dry. Join by following the mechanics on the rafflecopter. Fitness, Fashion & Freebies is not responsible for prize shipment. US Only, 18+. Good Luck. For working moms like me, I know how busy morning can be. From preparing the breakfast, to getting your kids dressed for school and rushing out to beat the traffic on the road, so you can come to work on time. It was indeed a busy morning that sometimes, we don’t have the time to put on a make up but don’t forget that besides being a mother, your also a professional who needs to look presentable and charming. Sometimes, busy working moms always reason out that their hands are all full and there are million things to do that even putting a lipstick would be very impossible. Here’s a quick make up guide for moms out there. But I came into realization that when I look better, I feel more better, even if it’s not a working day and you will only just stay at home taking care of the kids, it is always nice to look at the mirror with a fresh face than seeing yourself very worn out, tired and dull. I know, I’m not a professional make up artist nor a stylist but this quick guide is based from my own experience . This can help you look and feel beautiful in just few minutes of your time, barely 5 minutes on my part. To start with, make sure that you have your handy make up organizer to put your make up, so you can just get it out easily each morning. On that bag, you can put the basic, like an eyeliner, blush on, lipstick, mascara, pressed powder and for me, BB cream. It is also good to have the basic make up brush set, mine even though i have professional brushes, i enjoy using Avon’s brush set to help my make-up time smooth and easy. Make sure that before you apply your make up, you have a clean face. I have learned that using a moisturizer is very important. Avon’s Anew Vitale Day cream helps to energize your skin and formulated with Pro Energy Complex to help strengthen skin. It has Spf 25 also to help you protected from the harmful sun rays. helps disguise dark circles, blemishes and even out skin tone. The eyes is the windows of the soul and it can also reveal if you had a rough night. Even if your sleep deprived , a good eyebrows and a sheer, shimmery eyes can do the trick. Avon’s True colour eyeshadow quad in Purple Pop can be your day time to night time make-up. You can use the light shade for day time and apply additional coat for an emergency night dinner with the family or friends. I like Avon’s Super shock max mascara , it add dimensions and glow to my lazy eyes. Just a few coats and it makes my exhausted eyes to an instant wow with 15 x more volume. I’m a confessed lipstick addict, i so love putting different shades of lipstick and I could never leave the house without wearing one. For busy moms, it’s good to use a lipstick that can last all day so you don’t need to reapply always. Avon’s Ultra color lipstick gives a vibrant lip color that help your lips stay fresh and vibrant for hours with a nourishing formula and self renewing pigments. It only takes minutes for you to have a fresh glowing pretty look that is not over done and perfect for working mom. I always believe that make up helps every woman enhance the God’s given beauty to them. As for me and for many others, it also help hide those flaws and even the blemishes that I so hate. Avon has been a household name of many Filipino women, i remember the first time I acquired my first Avon lipstick and ever since, I’m a great believer of their products not just their make up but also their intimate apparel. I’m not an authority it terms of make up application nor I had a formal make up lessons but since I so love make up , i have learned through tutorials and from experienced as well. This will be my first make up tutorial and i do hope that I can help you even in a very simple way and of course i’m in the process of learning and will definitely wanted to upgrade my knowledge on this field. Avon’s newest make up collection offers a true, vivid color that can really make you look pretty and fabulous. With this look, i have used the one I have received from Glamour Box ( I was really ecstatic when I opened Glamour Box special Avon Edition Box) check out my experience on it on another post. To begin with; I used Avon’s Newest Skin Goodness Moisturizing BB Cream with SPF 20 and blend them in my face. I love this Avon’s Perfect Eyebrow pencil since it can use to apply eyeshadow on lid and eye liner. 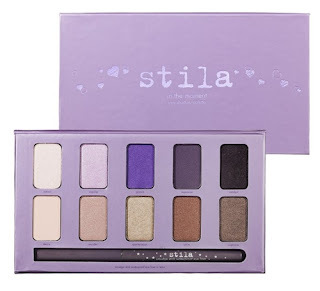 This True colour eyeshadow quad in Purple Pop that comes in the box was really pretty. I love pink and purples and this one is a perfect combination for day and night event. Although, I regularly use red or pink on my blush on, this Ideal Luminous Blush in Peach is simply natural. Honestly, i could not notice a difference at first (perhaps it’s my skin tone) but when I added some layer, I see that it was really nice and I guess, i would be using this for a while. So, what do you think about it? I hope you get some inspiration. Your comment, reactions, likes or dislikes is great appreciated. With many products that are coming in the market claiming that they can give you better result, it’s really hard to make a choice but when you find something that works for you, then I should say that you are very lucky. As much as I deny it, i’m getting older and sometimes my body says so and for a working mom with two kids, i need to keep myself healthy at all times. That’s the main reason, why i need products that will keep my body and skin healthy and beautiful just like when I was younger. It’s been months that I have been using Myra E hand and body lotion and vitamin E capsule and believe it or not, I am satisfied with it’s result. Even hubby was already using the lotion and as I have always mentioned, his rather hard to be satisfy with just anything but with months of continue using Myra E, it only means that he has just find his match. Myra E capsule has antioxidant properties that help repairs your damaged cells and since vitamin E is already proven to give radiant skin, does continued usage will give you result of a beautiful healthy skin that we all wished and yearn for. Although, i could not guarantee you that it can make your whiter since it doesn’t happened to me but what i can assure is that it can make you more fairer and the best thing is to keep your body healthy which I think matters most. In terms of Myra E lotion, i used it before going to bed since it has no spf but if your looking for one, they also have Myra E Daily Sun Protect facial moisturizer but i haven’t tried them yet since i am already using another brand. Myra E is a product from Unilab who has been there to keep families protected and healthy through their lifetime.